» Will We Ever Feel Comfortable With the Coach’s Son? Your love for sports did not start when you began watching other people play sports. Your ‘hard takes’ on sports issues aren’t just built upon the glorified opinion pieces that you read on the Internet. Rather, your emotional and intellectual connection to sports was most likely built on the playing field — even when you were playing in the most basic youth leagues. Your interpretation of ‘what is right and true’ in sports comes from personal experience. Concepts like winning, losing, and teamwork are generic, but you can only really feel what they mean by experiencing them firsthand. There is one concept from youth sports that we will never feel entirely comfortable with: the Coach’s Son. What do you remember about the most definitive Coach’s Son from your youth sports career? Generally, the Coach’s Son got more playing time than he deserved in a position that he wasn’t good at. Other players on the team had to accept the Coach’s Son as an on-field liability that they had to live with and work around. Sometimes the Coach’s Son was actually really good, but probably because his dad sent him to that really fancy training camp every summer. Michael Bradley’s dad was fired as his National Team Coach yesterday, ending one of the most high-stakes Father-Coaching-Son scenarios in recent memory. Michael definitely deserved his spot on the team more than Saul Smith deserved to play under his father Tubby at the University of Kentucky. However, there wasn’t an aura of greatness surrounding their relationship quite like that of Cal Ripken Sr. and Cal Ripken Jr.
Michael Bradley is obviously a talented footballer, but you could make an argument that his Coach Dad helped him every single step of his professional career. He was drafted by the New York/New Jersey Metrostars at age 16. The coach at the time was his father. His first two national team caps came under coach Bruce Arena before the team departed for the 2006 World Cup. Check out this picture of him before he decided to mimic his dad’s hairstyle. 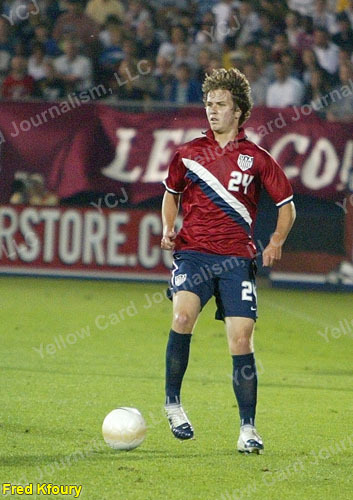 Since Bob Bradley took over the USMNT in 2006, his son has been a mainstay in the center midfield. Jose Torres, Jermaine Jones, Maurice Edu, and Ricardo Clark are all fighting to play alongside the coach’s son. Stuart Holden probably needs a look when he regains his form. Michael Bradley has been consistent, but fans probably just want a taste of a different combo, just to make sure that he really is the top choice center midfielder. Since moving to Aston Villa, Michael Bradley hasn’t gotten much playing time, so it sort of felt like his dad was “giving him reps” on the national team stage. Most other players in a similar scenario would have fallen out of favor in club and country. We wouldn’t have to confront our issues with nepotism if they had just won a few more important games. There has been a ‘movement’ by USMNT supporters to fire Bob Bradley for a long time. The team is perceived to have become complacent, especially after the recent Gold Cup losses to Panama and Mexico. Bob Bradley worked hard to achieve realistic results. However, it seems like we all struggled to evaluate Bob Bradley because of our inability to ever move beyond our personal experiences with the Coach’s Son. Unfortunately for Bob Bradley, the USMNT is judged on the team’s results AND based on the progression of the branded zeitgeist of American soccer. Maybe a coach starting his own son was ‘too American’ for us to process when we are trying to build an international brand and style of football. Eventually, the Coach’s Son reaches a level where his dad can’t be his coach any more. He forms his own identity where is he judged based on only his performance. Sometimes this ends poorly because his father can’t cover up his son’s shortcomings any more. Other times, the Coach’s son thrives without the pressure of his dad with a whistle. Professional athletes probably operate on such a high level that the Coach’s Son theory doesn’t apply. Hopefully Michael Bradley continues to grow, but you also worry that the next coach of the national team will use the Coach’s Son as a starting point to “rebuild” the team. The Father-Son relationship in sports always makes for an interesting human-interest piece, but in a results-oriented context, the Coach’s Son only deserves to play after the team has won. Sometimes I wish my dad were the coach of my youth sports teams, but having a soccer mom there to positively reinforce me probably made the experience less complex and way more enjoyable.